After not going into the museum for 2 weeks, I was able to volunteer this Wednesday. Dr. Willard was on a trip to the Falkland Islands, and things have been busy with illustration work and my husband's new print shop, so it seemed like a reasonable time to take a short break. I want so badly to visit that part of the world (Patagonia, the Falklands) that I shamelessly asked if devoted volunteers get discounts on Field Museum $10,000 cruises, or better yet, get to go free. I didn't think there was a remote chance of being able to wiggle my way onto that boat (and I was right), but did manage to stop myself short of asking if I could be stowed away in luggage. Who would ever know? Ah well, someday. I would love to be able to see an albatross colony. It was a busy Wednesday in the Bird Division prep lab. There were the group of three regulars: Glen, Joan, and Bob. They focus on ruffing out birds. "Ruffing" means removing all the feathers from birds that are to be made into skeletons. The dermestid beetles will not eat feathers, and so they must be removed in order for them to get to tissue, and thus clean the bones. Myself and Andria (Art Institute Student) were preparing research skins, as usual, and then there was a mother/daughter (home schooled?) pair that have been coming in helping Mary Hennen clean off skeletons that were coming out of the beetle tanks. I prepared a Woodcock (Scolopax minor), Black-billed Cuckoo (Coccyzus erythropthalmus), and Eastern Screech Owl (Asio otus). 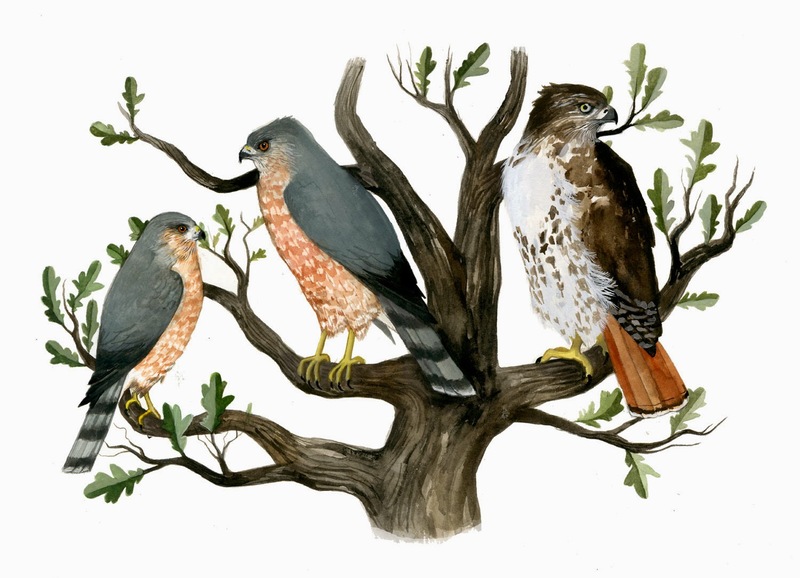 Paintings of these will be turning up on here soon, I hope, especially the owl. 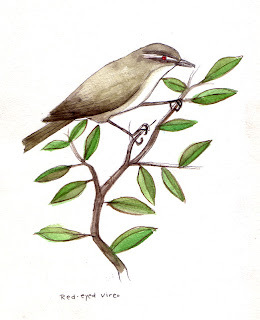 Several months ago, I prepared a Red-eyed Vireo, and just never got around to getting a sketch together. These vireos are quite common, and breed extensively across North America and Canada. They winter in the Amazon basin, east of the Andes. Their diet consists largely of insects, especially during the breeding season, and fruit largely supplements their winter diet. I love the olive green coloring and the bright, tomato red eye.